Doesn't the weekend always seem to fly by, and before you know it Sunday night has arrived. Well, luckily I had a very relaxing weekend, and we all have a 3-day weekend to look ahead too - yay Labor Day! So I apologize for the malfunction of last week's non-existent Mingle Monday. The website that I get the link code to was down for maintenance. that's okay though, I'll make it up to you by having a super fun Mingle Monday today! As you may have noticed, I've been MIA with minimal blogging, but this week I'll be back in action. I have 2 new [amazing!] recipes to share with you... one coming later this afternoon! Pass on the Mingle love. Tell a friend. Tell your mom. Just spread the word in some way (any way!) today. If you do, I will love you forever! We need new blogs to visit! You get out there and have a fabulous Monday, okay? Thanks for stopping by! As many of you read my post on Monday, I've taken off a week of work to help take care of my Daddy as he's in ICU after throat surgery. In an attempt to add valuable entertainment while I listen to my Dad snore, I figured we need a little belated blog hop today. Just dying to read your blog posts and have something to do while my favorite patient is snoozing! For those who have sent e-mails, messages, and comments asking how Dad is doing - thank you from the bottom of my heart. He is hanging in there - but relearning how to swallow is pretty tough, and he's a little discouraged today. BUT we have done laps around the hospital and he is talking pretty well given the circumstances! Possible discharge for tomorrow, which is great news! Pass on the Mingle love. Tell a friend. Tell your mom. Just spread the word in some way (any way!) today. If you do, I will buy you your very own snuggly puppy and bake you some homemade gooey chocolate chip cookies! Say an extra prayer of thanks for the healthy people in your life today. I truly hope your week has been full of wonderful things! Life has been pretty crazy this past week while getting ready for my Dad's surgery. Yes, surgery. In case you missed the post, my Dad was diagnosed with advanced throat cancer in May. Since then, he has completed chemotherapy, and we are now in St. Louis as he undergoes robotic laser throat surgery. I figured that I would share a little personal piece of my heart today in leui of Mingle Monday. All prayers and well wishes for a complicaitons-free day are so very much appreciated! Everything is going well so far. I feel very blessed and lucky to be a part of such a great cancer non-profit who has encouraged and provided paid time off so that I can be here with my mom and Dad. Meanwhile it's my job to keep my little brother and sister posted, as well as our friends and family at home! We had an early morning wake-up call at 4:30 a.m. in order to get ready and have Dad checked into surgical registration by 5:30 a.m. The waiting room was hopping! Mom and I were able to be with Dad the entire morning as they prepped him before surgery. He is in great spirits, as always, and seemed calm and ready to do a great job in surgery today. His attitude and outlook were overwhelmingly encouraging for us to see. We got a kick out of his surgery outfit and the really cool surgical hat that the resident had taped to his head. We all had a good laugh about it - including Dad! Soon after they paged us around 8:29 a.m. to say his surgery was underway. The surgical fellow said that his surgery should last around 6 hours - so he should be done around 2:30 p.m. today. We're looking forward to our afternoon post-op visit around 3:30 or 4 p.m.
We have been showered with love, support, prayers and well wishes all day long. So very thankful to have the amazing support team of family and friends. I promise I will get back to regular posting very soon - should have a lot of time on my hands as I hang in ICU and take care of Dad all week! I hope your week is off to a great start so far! As I listen to the music stylings of Norah Jones, it's storming like crazy here in the big Kansas City metro! BUT rain is my favorite! I am loving the rumble of the thunder and watching the raindrops stream down my office dormer windows. There is such rainy day charm from my third floor view in our renovated historic building office. Wishing you a beautiful week full of unexpected surprises! ...because I'm jumping in a car with BF and heading out of town! My family has already been up at the Lake of the Ozarks for a few days now, so we're excited to finally meet them out there. The lake house they rented sounds absolutely amazing! at night, because there are like 4 TVs! OH!!! Bring some movies... and some finger nail polish remover! :D"
What's on the agenda, you ask? Have a happy week, ya'll! 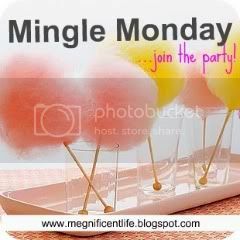 PS - Don't forget to check out this week's Mingle Monday Blog Hop. It's open until Friday, so get your blog some exposure, girl!